This article describes how to import contacts to a Reply campaign or account in general. Email and Firstname are mandatory fields. Other fields are optional - you can select multiple fields to map in addtion to the email and first name. You can also create a custom field and map it with a field from your .csv file. One contact can be be a part of only one campaign at a time. If you need to add contacts that are already in a campaign to a new campaign - you can use the Move to Campaign button. For more information on how to move contacts from a CSV file into a campaign, see the following article. This article describes how to import contacts using a .csv file or add existing contacts to a Reply campaign. While setting up a new campaign, you can add people to the campaign by either clicking the Add People button or the red + button (if there is at least 1 contact in the campaign already). You can do the same steps if you need to add more people to an already running campaign. When you select the Import from CSV option, you should either drag and drop the .csv file or browse from your computer. 2. After you have selected the file for importing, you will see the Map attributes step. 3. 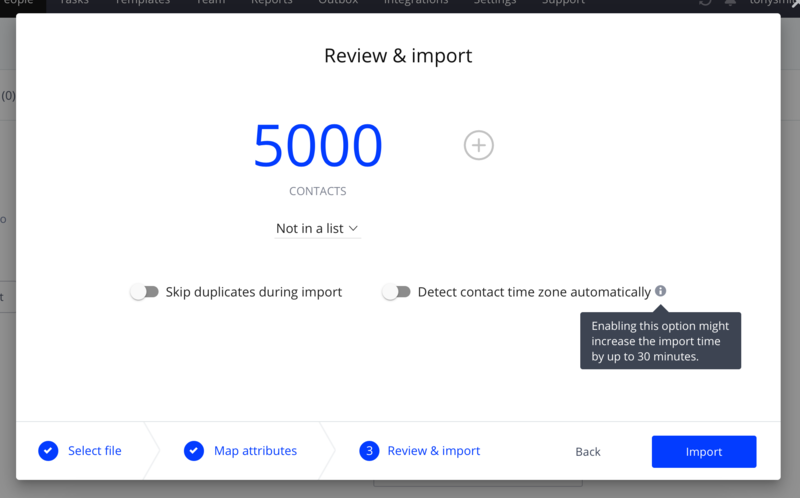 After you click Continue, you can select the list you want to import your contacts to or divide the number of contacts between a few lists (not more than 4). You can learn more about lists for segmenting your contacts here. Skip updating existing contacts option will help you to avoid overwriting the contact's data with the data from the new upload in case this contact already exists in your Reply.io account. Detect contact time zone automatically option will let you use the contact's time zone for sending emails in case you have City/State and Country in your CSV file. You can learn more about this option here. 4. After you click Import, the system begins processing the file. You can close the dialog window and continue working within Reply, or wait until the import finishes to see the results. When the import process finishes, you will see the notification in the notification area. Click View import results to open the Import results dialogue window. 5. 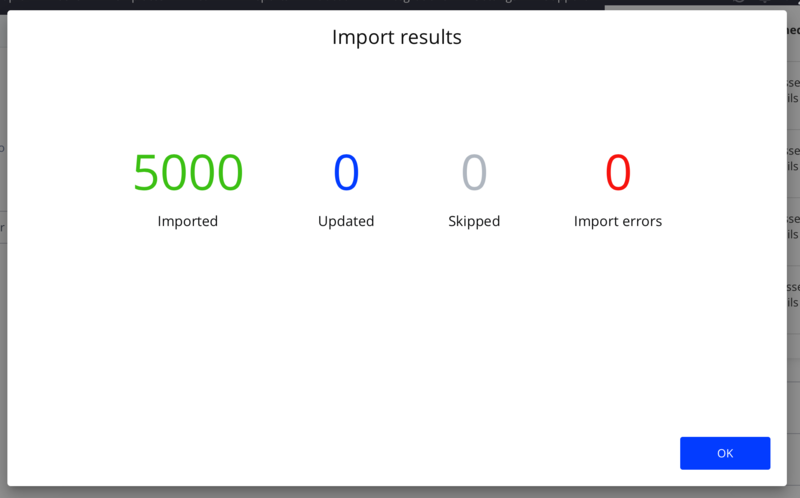 The Import results dialog window shows how many contacts were imported, updated or skipped, as well as the number of errors during import. In case of any errors, you can download a .csv file containing the errors. 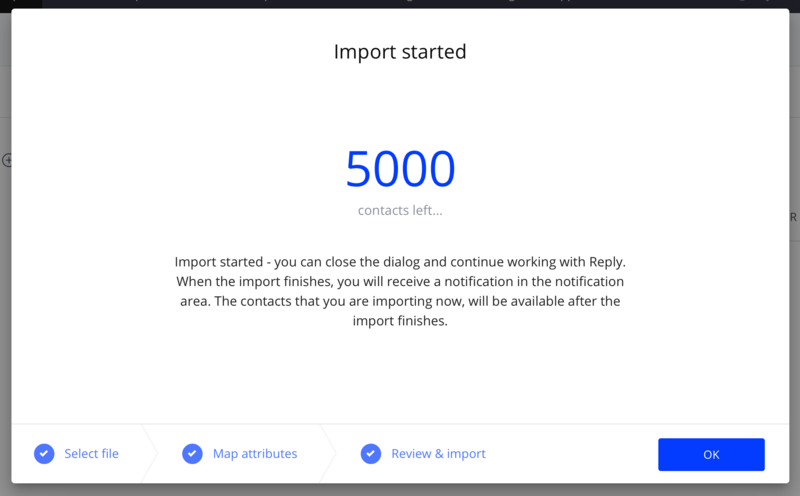 Imported means the number of contacts that are newly added to your account. Updated is the number of contacts that already exist in your Reply account. The current import updates the data in their profiles (if it differs). Skipped shows the number of duplicated records in your CSV. Reply removes duplicates at the import stage. Import errors - shows the number of records that failed to import. Most common reason is that First Name or Email is missing for that specific contact. 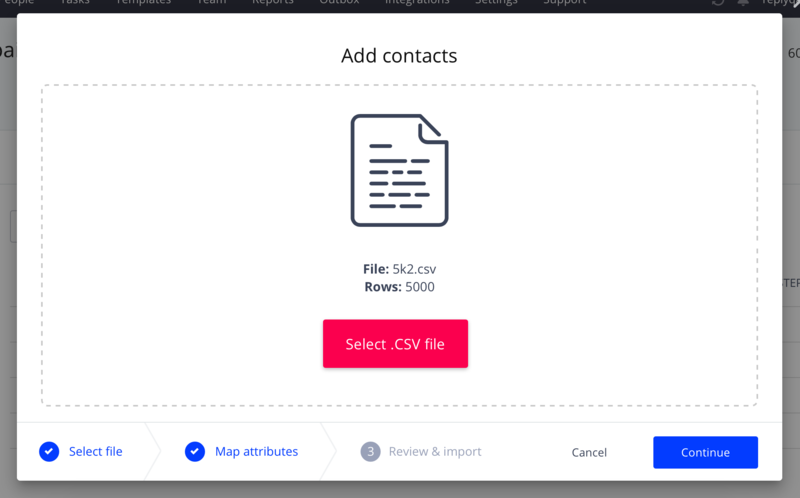 You will also be able to download the CSV with the contacts that failed to import. Wrong field format means that you are trying to import a text to a custom field with the number type. 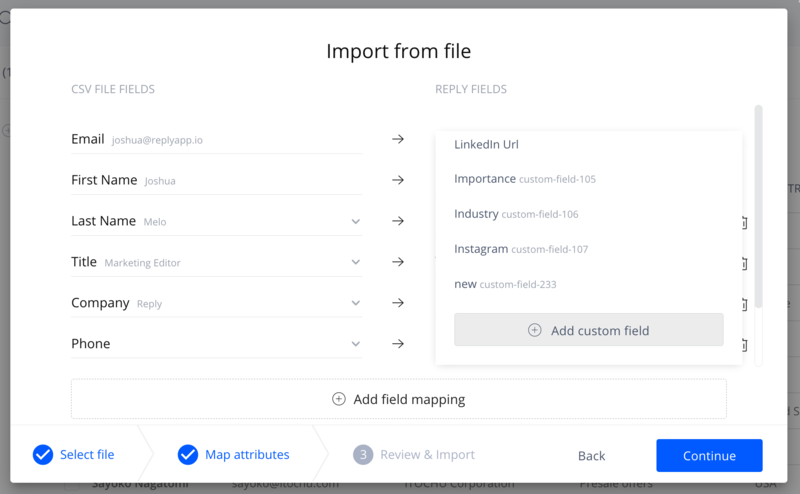 When you import contacts to Reply using a .csv file, you can map the .csv file fields to custom Reply fields. For more information on how to create custom contact fields, see the following article. Open the Import from file dialog window. 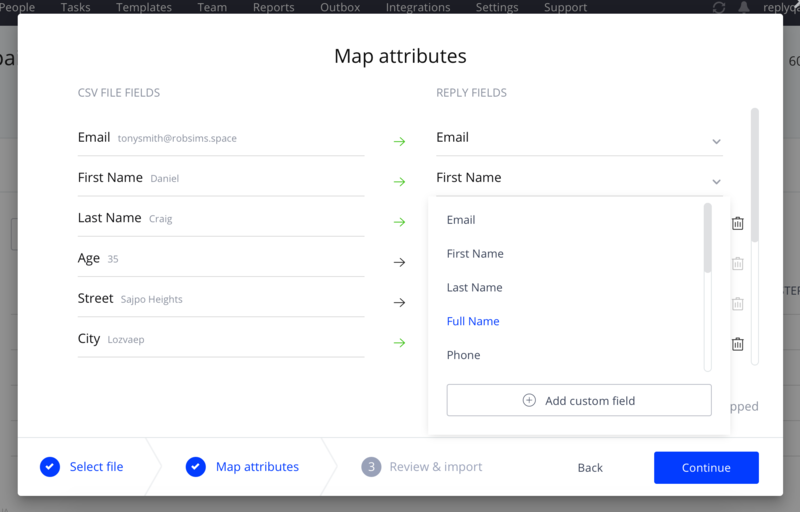 In the REPLY FIELDS column, select a field mapping that you want to change. If you have previously created the custom fields, select a needed field from the drop down list. If you want to create a new custom field, click the Add custom field button. In the Field label field, enter the name of the custom field. In the Field type drop down list, select the field type - text or number. Finish the Import from file procedure. Reply automatically validates email addresses each time you import contacts using a .csv file. All contacts with invalid emails are marked as Invalid after import finishes. The automatic check helps you to reduce bounce rate and improve overall performance of your campaigns. We also add contacts with the Bounced status to our database of invalid emails. You can remove the Bounced status for your contacts manually and continue sending emails to them, however, they will remain in the database for other users. In case you need to import contacts manually you can click on the Add People/Big Red Plus Button > Fill in the profile data for a contact > Click Save.